Later in Austen in August, we'll be hearing a bit from Among the Janeites author Deborah Yaffe, when she drops by to chat about Mansfield Park - and just why it rubs some readers the wrong way. And of course, before the next two weeks is up, you'll be hearing my thoughts on Among the Janeites. So check it out, keep an eye out for more, and of course, make sure you enter to win at the bottom of this post! whose passion has transformed Austen from classic novelist to pop-culture phenomenon? Deborah Yaffe, journalist and Janeite, sets out to answer this question, exploring the remarkable endurance of Austen's stories, the unusual zeal that their author inspires, and the striking cross-section of lives she has touched. Along the way, Yaffe meets a Florida lawyer with a byzantine theory about hidden subtexts in the novels, a writer of Austen fan fiction who found her own Mr. Darcy while reimagining "Pride and Prejudice," and a lit professor whose roller-derby nom de skate is Stone Cold Jane Austen. Yaffe goes where Janeites gather, joining a pilgrimage to historic sites in Britain, chatting online with fellow fans, and attending the annual ball of the Jane Austen Society of North America--in period costume. 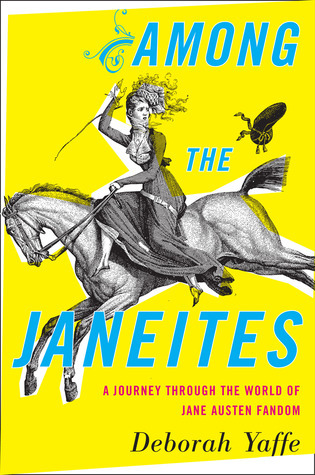 Part chronicle of a vibrant literary community, part memoir of a lifelong love, "Among the Janeites" is a funny, touching meditation on the nature of fandom. The awesome folks at Houghton Mifflic Harcourt have offered up a copy of Among the Janeites to one lucky Austen in August reader! This giveaway is US only (sorry, international Janeites! But don't worry, there will be plenty of chances for you to snag things!) Ends September 7th, 12a EST. Fill out the Rafflecopter below to enter. 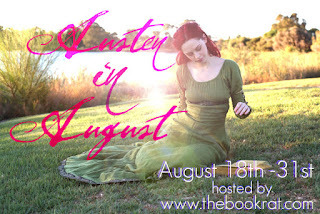 Please note: As with all Austen in August giveaways, you must fill out the giveaway registration form here in order to enter. This only has to be done once, and then you are free to enter all giveaways. Invalid entries will be deleted. I'm definitely in the newbie category, but I am determined to finish Mansfield Park this time! I will definitely be checking out the post on why MP is considered the most difficult/least favorite! Appreciative. I love Pride & Prejudice and Persuasion, I appreciate Mansfield Park and Sense & Sensibility, and I'm slowly learning to enjoy Emma. Jane Austen isn't my homegirl (that title goes to the unparalleled Elizabeth Gaskell), but I do like her work. Also, Mr. Darcy! Sa-WOON! I'm really looking forward to this book A LOT! My friends think I'm crazy (probably), my husband thinks our bookshelves are too full of Austen (not possible), and my favorite article of clothing is a scarf with Wentworth's "letter" printed on it (Love me some Wentworth!). It will be nice to know that I'm not the only one who has more than a passing love for all things Austen. I saw a scarf like that on Etsy and I WANTSSSSS IT, MY PRECIOUSSSS! Though I've enjoyed Jane Austen's work for years, I think I'm still a newbie in the fandom world. The LBD really got me into it last year. I'm definitely deliriously devoted... from my collection of Austen + Austen fan fic books to my husband's "I am Mr. Darcy" t-shirt. And yes, he wears it out of the house! And you bet I'll be dragging the whole family on a mini Jane tour when we finally make it across the pond a few years from now! I'm not sure what kind of Janeite I am! I've done a lot of academic study, but I'm not in the fandom. I think I'm a middle of the road Janeite. I'm not a newbie, but I'm not as knowledgeable as many. Thanks for the giveaway opportunity. I am a Sophomore Swooner. I'm not exactly a beginner, but I feel I still have a lot to learn and I've only read each of Jane's books once. I have lots of Austen sequels and got into this Austen thing back in '08 when P.B.S. aired lots of Austen movies. I'm not just a Janeite - I'm a Jane-oholic. Blushing newbie! Can't wait to read all the reviewed books. I am definitely deliriously devoted! I have heard nothing but wonderful things about this book. I am so excited to read it!! I've been a Janeite for well over 12 years now and would love to win this book, especially after hearing that one of my books just might be vaguely mentioned in it! Thanks for the giveaway! This book sounds like loads of fun! I may not be as devoted a fan as others, but I have a full liking and respect for all things Austen-ian. Her characters, her stories- the adaptions of her stories. I would totally do the dress-up-for-a-ball thing. *Sigh* that would be such a dream... ^.^ Thanks for the giveaway! This giveaway is from 2013, Noe & Cindy! Sorry, you missed the boat on this one.